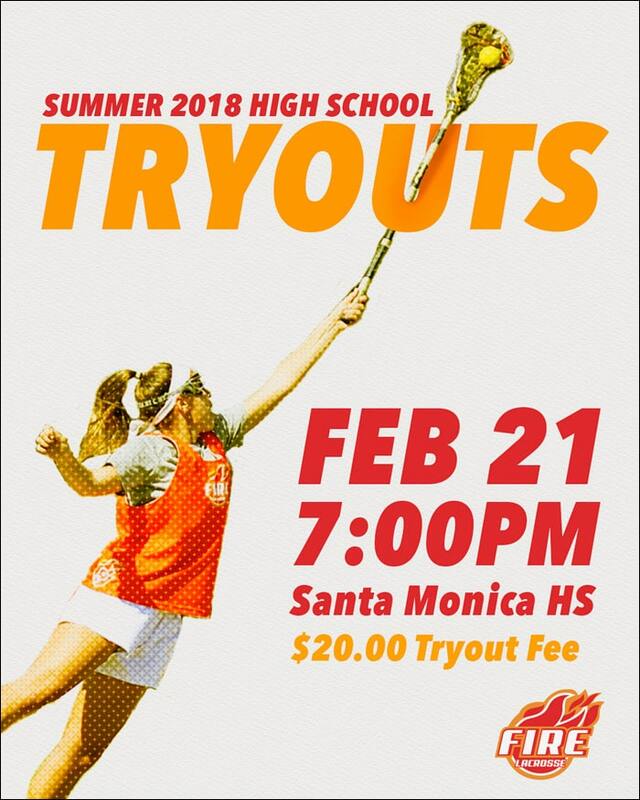 Fire Lacrosse of Santa Monica will hold tryouts for its summer 2018 programs on Wednesday, Feb. 21, at Santa Monica HS from 7-9 p.m. There is a $20 tryout fee upon registration. Fire Lacrosse is the Elite division of Dragons Lacrosse and offers girls dedicated to the sport a chance to play at a higher level and to reach higher goals. Fire is backed by an incredible coaching staff that trains players, guides them through tournaments and actively supports them in the recruiting process. The club offers an amazing team environment and a great attitude. This summer, Fire Lacrosse will be offering three different programs for high school players. Each program will attend a series of tournaments and have weekly practice through the months of May, June and July to complement the tournament schedule. Fire High School Travel Teams: These teams are the bedrock of the Fire program. They are for the players who want to stay competitive, active, play in west coast tournaments and enjoy the best team experience possible. The club will be creating two teams: Fire 2019/20 and Fire 2021/22. Fire Select: The club’s most advanced team program, Fire Select is designed for players who have a passion for playing at any collegiate level. Fire Select will attend major recruiting tournaments around the country, including Midwest Cup, Capital Cup, President’s Cup and Sand Storm, and will be composed of athletes from this year’s current junior (2019) and sophomore (2020) class. The cornerstone of the Summer 2018 program will be a 10-day East Coast trip that includes two tournaments, college visits, training with East Coast clubs or at East Coast facilities, as well as sightseeing. Fire Select Next Gen: The 2021/2022 (8th & 9th grade) version of Fire Select, Next Gen will be focused on training. In the fall of 2018, Fire Next Gen will attend President’s Cup as well as local tournaments. In 2019, Fire Next Gen will follow in the same path as Fire Select and become the Select team. For more information, visit Fire Lacrosse here. To register for the Feb. 21 tryout at Santa Monica HS, click here.